DIY Hanging Lanterns to beautify your indoors and outdoors. These elegant lanterns are easy to make and a perfect way to add warmth to your space. If you love outdoors, make these DIY hanging lanterns to decorate your home for outdoor dinners and parties. Most of these ideas can be completed in a few hours and make use of easy to find supplies that you might already have. 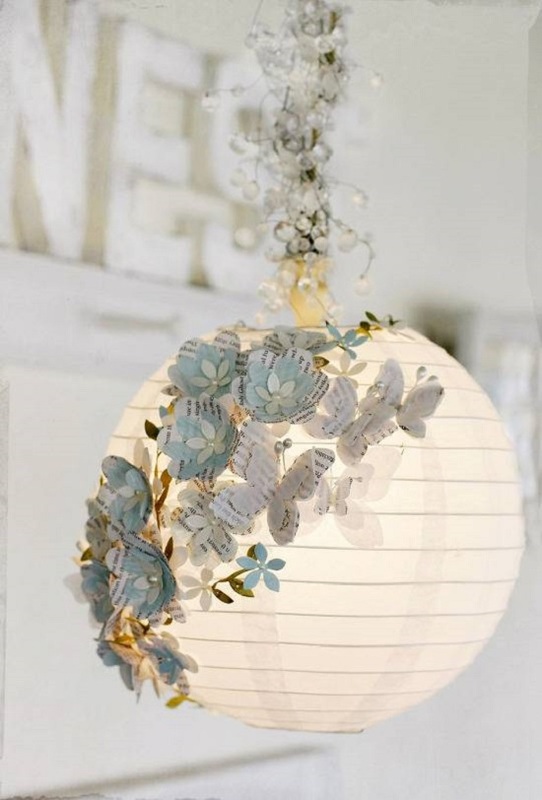 Embellish a paper lantern with paper butterflies and flowers to give it an ornamental appeal. Give your room a blessed decoration with a set of these lanterns here. Use a hanging planter basket and some ribbons to lay out this amazing chandelier with paper circles. Follow Design Sponge. For this pretty lantern, all you need to do is to stick paper doilies onto a paper lantern using double-sided tape. Hang the paper lantern from a height using a string. 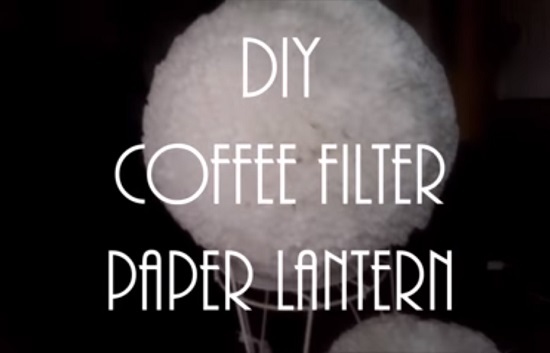 Assemble lots of coffee filters onto the top of a paper lantern to give it a fluffy look without any effort. You need some hot glue and a paper lantern apart from coffee filters. 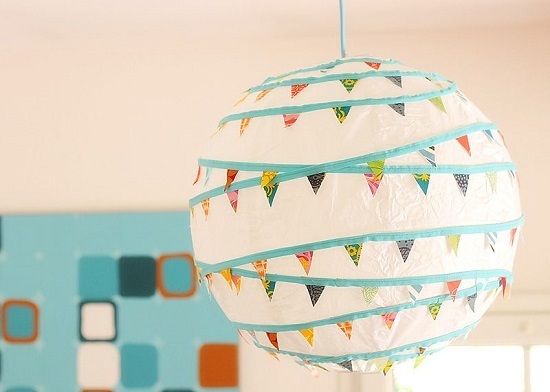 Give a festive makeover to a plain paper lantern by similarly gluing fabric pieces as here. Experiment with the ways of attaching the fabric to personalize the lamp. Cover a paper lantern with a fine coat of glitter (whichever color you like) to redo this lantern idea. Finish it off by adding the bulb and other ornaments as you want. We found the idea here. Glue pointy paper strips around a paper globe lantern; starting from the bottom to the top. This DIY is sure to give an animative effect to your room at no cost. Wrap a paper lantern with enough tissue circles to recreate this lantern idea by Martha Stewart. You can either cut the circles manually or buy them from your local store. Bring an aquatic sense in your room by imitating this jellyfish paper lantern using ribbon curls and sequins. Also, it’s a fantastic way to upcycle a damaged paper lantern. Following any other lantern DIY as this, you can easily create a vibrant lamp. You just need to use rainbow colored circles to obtain such a lantern. Take inspiration here. Decorate a simple paper lantern with paint, lace, mod podge, and fabric scraps to make a wedding decor out of it. Tutorial for this DIY is available here. This is a typical lantern DIY, which is made using twine, balloon, and PVA glue. 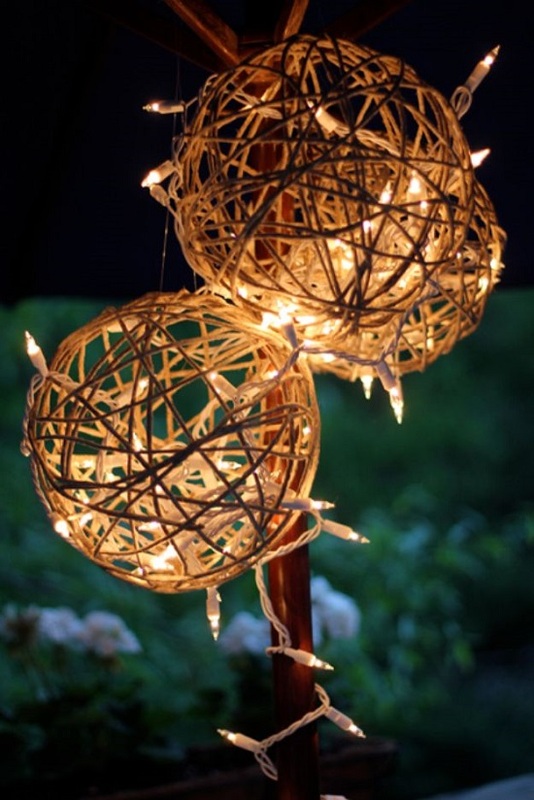 When done, you can insert string lights into each ball for a rustic decor! Have a look at this tutorial. Glue paper flowers onto the surface of a lantern and embellish with pendants, that’s all you have to do. Get the directions at Consumer Crafts. Light up your outdoor dining evenings with these watercolor lanterns in your yard. 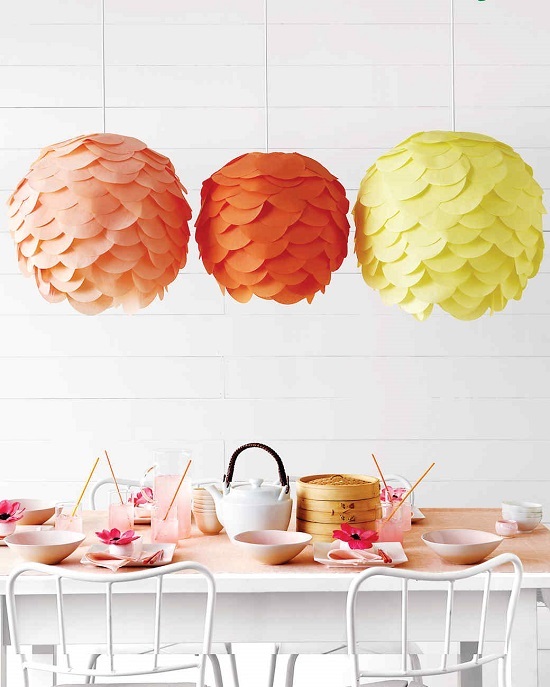 Simply color small paper lanterns with watercolors and add some textures, that’s it. Hope you found some inspiring ideas in our list of DIY hanging lanterns. Be sure to leave us a comment below if you have any ideas or questions!